Is your old tile flooring starting to show signs of damage or age? 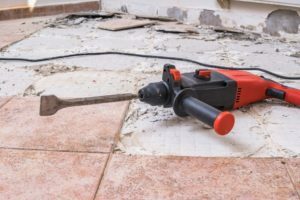 Perhaps now is the time to consider tile removal services in Mansfield, TX. American Flooring Removal is the number one flooring removal service in the region. For good reason, too. We provide exceptional quality at an affordable rate. Furthermore, we eliminate the mess. That’s right, we have developed a dust-free tile removal process that makes the process easier from start to finish! There are numerous reasons to schedule floor removal. You may wish to renovate your home or replace your floors with a new material. Whatever the case, American Flooring Removal is committed to providing quality results. We know the difference that exceptional flooring can make in your home. Speaking of the difference, the right flooring can improve the overall value of your home. First, you need to tear up the old floors. American Flooring Removal can help. Our dust-free tile removal process ensures your home is free of any mess and opens up the possibility of new, high-quality flooring in any room in your house. There are a number of fantastic reasons to choose American Flooring Removal for your home. For instance, we offer affordable, competitive pricing for all our flooring removal services. We do so without sacrificing quality. When you schedule tile removal with our team, you receive unparalleled service and commitment unlike any other. Mansfield, a suburban city, is part of the Dallas-Fort Worth Metroplex. Sitting adjacent to Arlington, Mansfield is home to plenty of unique attractions, convention centers, and cultural eateries that shed some light on the world abroad. If you want tile removal service in Mansfield, TX, done right, pick up the phone and call American Flooring Removal. Call 469-556-3936 for expert service now! We serve entire Mansfield, TX 76063, 76065, 76084.